Donald Gayton Phelps was a remarkable educator who broke new ground for African Americans in the Pacific Northwest and across the country. He was best known for his keen intellect, powerful voice, and gracious spirit as he served as a role model, mentor, and social critic during his lifetime. Born on July 22, 1929 in Seattle, Don Phelps was the grandson of John T. and Magnolia Gayton who were among Seattle’s first 19th Century African American settlers. As a young man, Phelps studied music for three years at the Cornish School and sang frequently at Lincoln High School and in the First African Methodist Episcopal Church choir in Seattle. He earned his bachelor’s and master’s degrees in education from Seattle University and his doctorate in education from the University of Washington. Phelps’s teaching career began in 1960 in the almost exclusively white Bellevue School District. He taught 4th, 5th, and 6th grade students at Robinswood Elementary, and in 1963, he became the first African American principal in Bellevue. His students remember him fondly for his booming voice, direction of the school choir, and his passion for students. For nearly all of his students, he was the first person of color that they knew. From 1967 to 1969, Phelps served as the first African American principal of Bellevue Junior High School which made him the first black secondary school principal in the state. In the mid-70s he served as interim superintendent of the Lake Washington School District. In 1980, he became the president of Seattle Central Community College, and in 1984 he was appointed to be the chancellor. From 1968 to 1972, Don Phelps was a regular commentator on community affairs for KOMO, a Seattle radio and television station. In many of his more than 700 commentaries, he addressed racial issues in one of the most volatile periods in the city’s history. 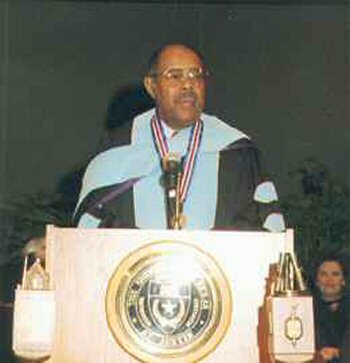 In 1988, Phelps was appointed the chancellor of the Los Angeles Community College District, the largest and most diverse community college system in the nation. In 1994, he moved to Austin, Texas to serve as the W. K. Kellogg Regents Professor at the University of Texas where he was integrally involved in training future African American presidents of community colleges. Donald Gayton Phelps died in Austin from a heart attack on July 5, 2003, but left a lasting legacy across the nation. He was survived by his wife Pamela, his three children Richard, Michael, and Dawn, as well as five grandchildren and two great-grandchildren. Seattle Times, July 8, 2003; Seattle Times, July 9, 2003; Mary Henry, “Donald Phelps,” HistorylLink.org.